Please make sure to use genuine Kanger Replacement Dual Coils only, as it will help with battery life and best vapour quality. EMOW atomiser uses same Kanger Replacement dual coils as of KangerTech Protank V3, Kanger Protank Mini V3 as well Kanger Aero Tank Mini and Mega. The Kanger EMOW kit received the silver star from eCig World Australia !!! This starter kit is both elegant and powerful with its 1300 mAh battery and provides a great vaping experience thanks to its Kangertech eMOW tank. The Kanger EMOW 1300 mAh Kit is the new starter kit from Kanger. It has 1300mAh battery with voltage adjustable at 3.7V, 4.2V and 4.8V. The Kanger EMOW tank is a 1.8ml adjustable airflow pyrex glass tank. This genuine Kangertech EMOW Starter kit comes with the latest Bottom Dual Coil Changeable (BDCC) EMOW clearomiser and a 1300mAh Variable Voltage EMOW battery for great flavour and vapour. Easy to fill and refill, the EMOW clearomiser is made from metal and pyrex glass so will work well with difficult liquids. It comes with a unique adjustable airflow base (similar to the AeroTank) which means you can get your perfect vape exactly the way you want it. It is also slightly wider than regular clearomisers which makes it a perfect fit with the 1300mAh Kanger Variable Voltage EMOW Battery. To unlock, simply press the button 5 times rapidly again and the LED will confirm it is unlocked. To adjust the voltage on the battery, you press the button 3 times within two seconds. The light will flash either red (3.7V), green (4.2V), or white (4.8V). If you are looking to buy one stepup electronic cigarette than Kanger EMOW kit then please have a look at the high end solid gear we have on offer, it is Aspire Nautilus Mini CF VV Starter Kit, It is slightly dearer but work every cents. 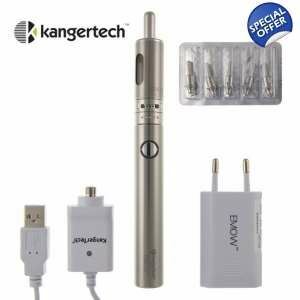 Checkout our recent Review, Tips and Where to buy Kangertech EMOW Starter Kit Australia? and comparing of Kanger EMOW Kit v/s Kanger EVOD starter Kit.